Following a preliminary visual inspection of the site and taking into account information gleaned from the local biodiversity records centre, Bluebell Ecology will, if necessary, assist with the dormouse presence/absence survey. This can include installation of monitoring devices, suitable regular monitoring and appropriate reporting. Barn owl surveys may be requested by a land owner, developer or planning authority. Typically, barn owl surveys will be requested in relation to planning applications to re-develop buildings located in rural surroundings. A barn owl survey involves obtaining a desk study to assess records of barn owls and/or nest sites in the surrounding area. This is followed by a site survey to identify evidence of barn owls roosting or nesting, such as live or dead owls, feathers, pellets, nesting material, droppings and eggs. Bluebell Ecology will then assess the level of use of the site by barn owls. If barn owl presence is recorded at the site and the works are deemed likely to disturb nesting barn owls or their dependant young then a license from the relevant Statutory Nature Conservation Organisation (which in England is Natural England) will be required. Bluebell Ecology can assist with the license application and any required mitigation strategy. Advice on how to incorporate barn owl habitat into development. Barn owl numbers have declined in number and their distribution throughout the UK due to a combination of habitat loss, fragmentation and deterioration, due to poor habitat management and development. This has resulted in the species being vulnerable to extinction with a current estimate of no more than 4,000 pairs in the UK. Barn owls require either pastoral, arable or mixed landscapes with between 14 ha and 47 ha of rough grassland within 2 km of their nesting site. The barn owl is protected under the Wildlife and Countryside Act 1981 (as amended). 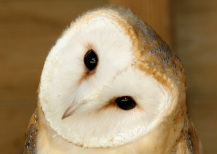 Barn owls, their nests, eggs and young are fully protected in UK law. deliberately disturb, capture, injure or kill a barn owl. take, damage or destroy their nest while it is being used or being built. possess, or sell a wild barn owl.